the annual summer sheep fair. 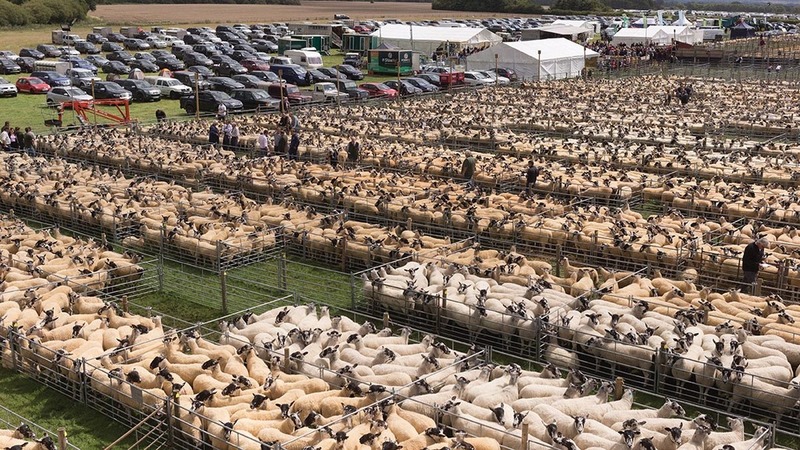 A STAGGERING entry of 26,601-head of breeding sheep and store lambs descended on the pens at Thame for the annual summer sheep fair. The sale grossed £3.5 million and set the benchmark for other sheep breeding sales of the season. Top priced lot of the day was a Texel ram at £910, and leading female was a Beltex making £540. In the shearling ewe prices, Mule bidding reached £195/head for the winning pen from Henry Tustian, Epwell, who also took the trophy for the best run of sheep, after having other lots at £180/head, £178/head and £172/head. The smarter Mule shear- lings found particular favour this year, selling either lambed or dry. Eddy Bullman, Buckingham, headed the Suffolk cross class and sold the prize winners at £158/head. Pure-bred Cheviots from Garfield Stephens, Melton Mowbray, sold to £190/head and the same vendor headed the Scotch Halfbreds prices with pens at the same money. T.C. Dawson, Co Durham, had a run of 715 Texel cross North County Mule ewe lambs take top section honours by selling at £120/head, £110/head and two pens at £98/head. Older ewes were a strong trade, as Suffolk crosses from Peter and David Morris, Brill, sold at £130/head, with Mules from Messrs Pearson, Towcester, at £115/head. The best store lamb price was £77/head, paid to H. Levinge, Stains, while Chris Tucker, Devises, sold Continental type stores to £68/head. The catalogued entry of rams was similar to last year and met a mixed trade. In the MV accredited section, the Midland Beltex society held its annual show, where the male champion, a shearling ram from Andrew Bishop Bishop, Eldersfield, sold to £740/head. The female champion was a shearling ewe from the Freckleton flock from V.J. and M.L. Roots, Southam, which later hit £540/head. A Texel shearling ram flew to £910/head for R. and B. Smith, Slapton, while a Beltex cross Charollais shearling ram from the same home sold for £770/head. Shearling; Mules, £130.10 (+£7.20); Beltex crosses, £162.99 (+£28.99); Texel crosses, £141.44 (-£3,66); Suffolk crosses, £131.91 (+£6.91); Scotch half-breds, £176.61; Cheviot crosses, £138.00; Lleyn crosses, £120.95; Beltex show; 10 shearling ewes, £445; 7 shearling rams, £540; 2 ram lambs, £360; Texel shearling rams, £463; Blue Texel shearling rams, £430; Beltex cross Texel shearling rams, £410; Beltex cross Charollais shearling rams, £496; Charollais shearlings rams, £425; Charollais ram lambs, £391; Charollais ewe lambs, £126; Suffolk shearling rams, £468; Suffolk ram lambs, £361; Lleyn shearling rams, £311.